Most recap episodes can be a chore to watch but this one might be an exception. It's possible for some people to think that 91 Days' plot is a bit convoluted due to its fair amount of characters and family politics. So for those who feel a bit lost, this might be one of the few recap episodes that is actually worth watching. We get to see some of the more important scenes so far and when any relevant characters are shown on screen for the first time we also get some text reminding us of their role in the story, their family and such. There is not much else to say, really; it works for what it is. 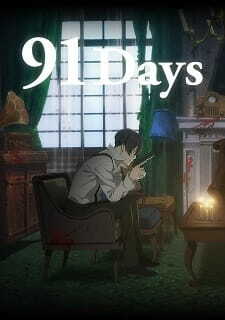 Therefore, 91 Days Recap is here and there is no episode 8 but that recap is episode 7.5. So...I drop episode 7.5 really BAD, because I have no interest of watching this recap. For example like Attack on Titan, they had recap which is FINE, in therefore the fans need to remember what's happening and what's has related to the episodes. But 91 Days was a bit straight out, the fans had already know Angelo wanted to kill Nero when he had grow up but he also need to find out the last person who killed his parent. The other thing is Nero was involved for killing Angelo parent and Angelo had already know it. I would suggest you to watch the recap because it helps you to remember till you get it right but if you don't, it doesn't matter at all whether watch it or not. A recap after a mere 7 episodes....WOW! Shuka really needs more budget. OR ELSE we're gonna be seeing more of these. Most people shouldn't forget what happened but, if you have amnesia or something, it might be worth watching. As it is a recap, it recaps the significant portions of the story from episode 1-7, however, it often takes too long in certain scenes and glosses over other ones that are equally important. It does a decent job of summarizing what is going on, but a few important scenes or explanations are missing so you HAVE TO go watch the actual anime. Not everyone enjoys themselves a recap, especially on short series such as this one but recaps are not just a reminder, well, most of the time they are. But not always. In some few shows, especially the short ones, the massive character rooster can be pretty overwhelming and hard to keep up with, a lot of new names all at ones can ruin great moments and distract you from important conversations, but 91 Days Recap at least nails explicitly at its core with this one. As simple as it can get, a young kid survives the massacre of his own family and devotes his life to get the revenge. Making a come back after 7 years and penetrating the family responsible undercovered as one of their members, and it gets much more complex as it goes on. The pacing here couldn't really be any good more than it already is, not too rushed or too slow. As simple as it looks, the animation has some quality to it here. The art style looks very generic but not funky or bad, every move is fluid and complementary to the fast-paced music as well. I like the approach they took with presenting faces and expressions, you don't see any characters having their eyes taking half the space on their face. The art style looks a lot realistic than what you get nowadays, seeing how this is a modern series. I absolutely love the opening and end theme songs, let's not forget the soundtracks. One other thing that made me glad to have chosen the DUB version was the accurate translation and accent imitation. All the voices matched their portrayed faces and attitudes perfectly. I have no problem with the characters, of course, I dislike some but for a reason is that you as the viewer are supposed to not like them, something that I think this show does perfectly. I'm not much of a recap fanboy, but I like me some good ones, and this one didn't disappoint. It's just a retelling of the first 7 episodes focusing on highlights that have come to pass, just what I needed with this type of shows. I wouldn't actually recommend this if you're not too invested in the show, but it's always fun to pick up old stuff that you didn't notice at the start or just to refresh your memory on the big bangs that have happened. Anyways, this was a solid recap in my eyes.